The photograph illustrates a few of the standard sizes and colors available. Panels, tilt stands and rack adapter angles shown are some of the standard accessory items available. Recessed panel mounting channels and structural supports (4 per case). Standard EIA and WE hole spacing provide for front mounting and internal equipment mounting. Hardware supplied. 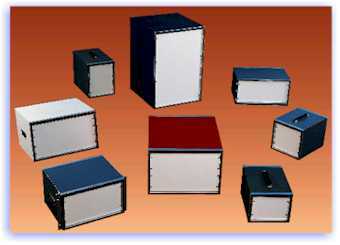 High in quality and distinction, moderate in cost Trimline instrument cases, with their extraordinary strength, beauty and utility, are designed to meet the engineering and marketing design requirements for electronic products packaging for free standing or rack mounted instrumentation or systems. tilt-stand, front and rear panels, slides, rack adapters, chassis and shelf support angles, and access doors with or without locks. Ventilation provisions and other modifications are readily available at nominal cost. 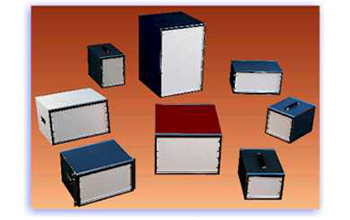 The large variety of sizes, the adaptability for equipment mounting requirements, the variety of finishes and the ready availability at modest costs make the Trimline Series of cases an ideal choice for electronic product packaging. 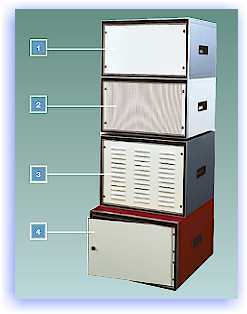 Requirements for special ventilation, screening, cutouts, access openings, etc. should be submitted for quotation. A special design size (15 5/8 inch panel width) has been incorporated into the Trimline instrument case line which makes the entire case easily adaptable into standard 19 inch rack systems. 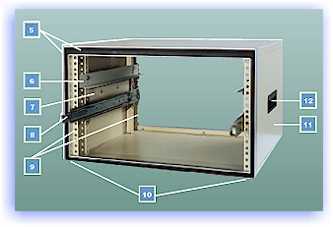 The overall case width accommodates rack adapters to fit cleanly into 19 inch rack widths. The overall case height conforms to standard panel heights, requiring no fillers to adjacent panels above or below the Trimline Case. This design size is especially desirable for bench or desk instrumentation that may be rack mounted without requiring a different sized enclosure for each usage.